Last week I spent a couple of days at Muskoka Bible Centre, a Christian camp north of Toronto where we love to spend time in the summer. While there I cracked open a new book by Michael Haykin and saw that, fittingly enough, he had dedicated it to the staff and guests of MBC. I took it as a sign that I ought to keep reading. I’m glad I did. The next six chapters explore what it was like to be a Christian woman in the eighteenth century. Here he looks at Anne Dutton, a theological writer; Sarah Edwards, who “reveals the way some Christian women have had profound experiences of God for the blessing of the church;” Anne Steele, who wrote hymns which are still treasured today; Esther Edwards Burr, Sarah Edwards’ daughter, who has much to say about Christian friendship; Ann Judson, who was a pioneer missionary and “something of an icon for generations of women missionaries who followed her;” and finally Jane Austen, easily the most famous of the subjects, whom few know to be a serious Christian. In this way the book is more than a collection of eight short biographies. Yes, Haykin provides biographical details, but his purpose is less to recount the character’s life than to point to her faith and to the way she grew and served during her lifetime. He means to show the vital importance of women for the life and health of the Christian church. He does not merely describe these women in relation to their husbands as so many biographers have done (at least for those who had a husband), but shows that they were godly in their own right, that even apart from their husbands they had deep faith and a desire to serve the Lord and his people. They were, indeed, women of faith. As for me, my favorite chapter was the one on Jane Austen, perhaps because I’ve read so little about her faith (which seems to have been very strong and genuine) or perhaps because I’ve only just begun to read and enjoy Emma, which many regard as her finest work. 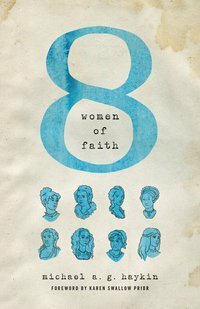 In Eight Women of Faith, Michael Haykin was provided a neat book, a helpful book, and a unique book. He has provided a book that will benefit any and all of us. I recommend it!